Coming from a Mathematics intensive background, I always try to know as much as I can about, and contribute if possible, the local state of science education. Mathematics is a science too, you know. And mathematics and logic often go together. 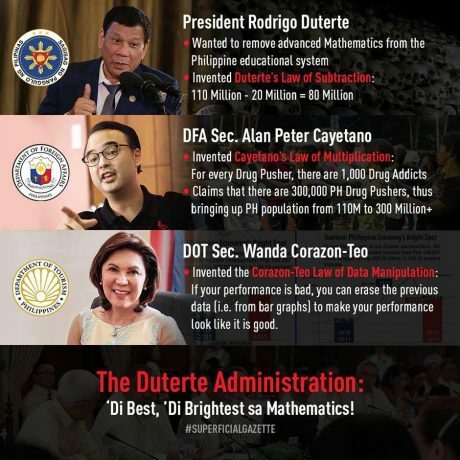 Mr. Duterte, may we in the engineering and scientific community remind you, that Algebra, Trigonometry, and Calculus form the foundation for your so-called Business Math and Statistics, and the entire engineering and scientific body of knowledge. They are all interconnected. Fast forward to today, and now he’s been president for quite a while. Not much to say about these that hasn’t already been said. The Duterte administration and its followers can very well defend themselves (and strike back hard) anyway. Instead, what I’d like to point out here, is that for all the “correction” and “pointing out of errors” that Duterte’s critics like to do, they seem to conveniently overlook the flaws in their own thinking. The noisiest (and one of the most empty) among Duterte’s critics are supporters of the Liberal Party, the political entity that was in power before he won the presidency. They’re also known as Yellowtards, by the way. And once again, they stand on the precipice called lack of credibility. The reality is, very little about the Yellowtards, or even Duterte’s critics as a whole adds up. They continue to exist as many disparate voices which, quite simply, will never form a formidable whole. 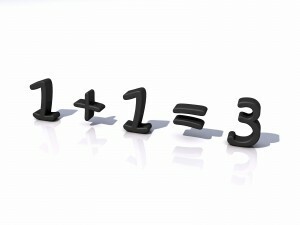 Politicians do seem to practice fuzzy math, out of habit, to beguile voters. For the next six years, however, it is Duterte who adds up for the voters. The LP and their supporters quite simply don’t anymore. Next Article Ozamiz Mayor Reynaldo Parojinog shooting: Justice delivered or crime committed? Mathematics is an exact Science. From Simple Arithmetic to complicated Differential and Integral Calculus….to Differential Equation, and to more complicated branch of Mathematics. Most Politicians, throw “Statistics”, to confuse us in their arguments. Statistics can be manipulated to politician’s advantage. Most of the people are not familiar with the Science of Statistics. Anyway, it depends on what educational level, you have…these politicians will always do some tricks, to confuse your clueless intelligence; and convince you they are always right. By this Age of Information Technology and Artificial Intelligence…they will soon use the machine (Artificial Intelligence), to confuse us further, and get our votes. The SMARTMAGIC and the HOCUS PCOS voting machine is just a prelude of what to come ! Wow, what a poor scientist a mathematician makes! The author tries to convince that mathematics is science (although its only a small cog, a tool in true scientific procedure) then proceeds to the most unscientific opinion ever. While he thinks he is clever, the scientific method is defined, pose a hypothesis, test it, compare to published science in a discussion and then provide a conclusion from which science can use to evaluate further. The author has claimed to be scientist (unjustified as he is tool to scientists or simply a tool) left out any scientific rigor, used a highly derogatory term to both free thinkers and those with developmental or injury related challenged cognitive functions (reference to tards) then his conclusion is that people who speak out are all incorrect based on polls? Scientist no, mathematician unlikely, political blind and pro Duterte definitely! This is why the Philippines is in so much trouble, people claiming to have intellect failing miserably but posting partisan articles – its propaganda pure and simple! A challenge to the author -debate me on science or stop using it! I would actually expect a better article from my seven year old as she actually knows scientific theory and will be groomed to be able to lead Philippines in the decades to come! Lol! Another point-missed here. Your literal interpretation belies a one-dimensional mind that failed to see the bigger context being painted here. Sure, we can debate science and math if you want. But we’ve got articles that actually do those. This one has a political message. You noticed that of course, but you did so and formed a flawed conclusion of the author’s intent. What makes you a pro-Marcos loyalist? Pro-discipline, pro-authoritarianism, pro-New Society for peace, unity and progress. Don’t you just love the “nagmamagaling” who end up as point-missers? Hahaha. @Skeptical: I’m pretty certain FallenAngel didn’t write this. He (she?) rarely or never writes partisan pieces. He often has a very solid argument to make, about something important, backed up with facts. I’ve never seen him use the word ‘yellowtard’. I’m guessing he actually is what he previously claimed to be (mathematics and/or science background). Read the quoted article and you’ll see what I mean. The general style and content suggests that this is another Benign0 essay with FallenAngel’s name on it. In fact it seems that all the more interesting GRP writers have either jumped ship or (in the case of Kate Natividad) turned to writing empty nonsense about actors. The increasingly bizarre series of bootlicking articles from Benign0 and Ilda makes me wonder whether they’ve received “an offer they can’t refuse”. There was some other blogger (the name escapes me) who was co-opted into the government propaganda machine quite recently. For what it’s worth, I think it would be sensible to focus on basic arithmetic for the majority of the population. I’ve noticed most Filipinos are hopelessly bad at math, and only 0.01% of them will ever need trigonometry or calculus. It wouldn’t hurt to teach some basic statistics. I’m sure the endless get-rich-quick scams are fuelled partly by the Filipino inability to add 1+1 to make 2. The other part, of course, is greed and laziness. Anyway, whether math is a science is irrelevant – personally, I’d say it is, because mathematical research is conducted using (broadly speaking) the scientific method. @marius: Interesting theories you have there about our internal affairs. But like most schmoes, you’ll just have to keep guessing, won’t you? Forget all mathematics and science. all we know is: no drugs no corruptions no terrorism equals good president Duterte that’s all. Benign0, Ilda: interesting that you’re adopting the same conversational style as our Dear Leader, ie., no actual facts to hand, so roll out some insults or non sequiturs. Let’s have a bit of fun with logic and probability. If someone accused me of writing an article under someone else’s name, I’d be indignant. I’d simply respond: “you’re wrong”. FallenAngel hasn’t done that. In fact it seems to be Benign0 writing all the responses to comments. If the accuser was in fact correct, I’d be embarrassed, and maybe I’d throw out some irrelevant distraction. So, in the absence of any information except Benign0’s coy response, I’d say there’s a non-zero chance I’m right. Now the other matter. If you were indeed being told what to write, you couldn’t admit it outright because, you know, nobody wants to end up as a corpse with ‘drug dealer’ tattooed on their face. Someone with integrity might try to drop hints, but perhaps not-too-obvious ones. If, on the other hand, you actually are True Believers in the Messiah, you’d just come right out and say so, because you have nothing to be afraid of. So, again, there seems to be a non-zero probability I’m right. Of course probabilities are just probabilities. The third option is that this blog has finally jumped the shark, and all its contributors have joined the collective insanity that’s gripped the entire nation: hallelujah, the savior is here! That’s right folks: one man is going to singlehandedly rescue 100 million layabouts from their own turpitude. Me, I’ll just start microwaving the popcorn; we’ve got one hell of a show coming up. I’m happy for you, seeing that you are resting assured of the soundness of your personal theories about us. What makes you a pro-Marcos loyalist!? If I accuse you of being a Martial Law lover, Pro-Marcos Loyalist and Neo-Nazi, I would be tagged as communist, ISIS terrorist and Anti-Semite lol.